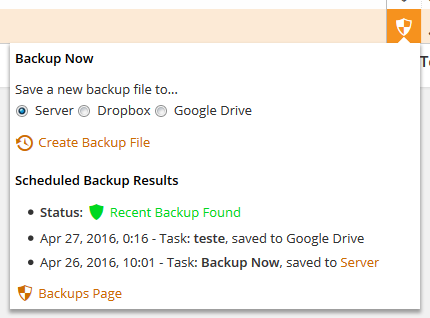 The one click backup feature does now support uploads to Dropbox and Google Drive. Provided you have connected those accounts to CMS Commander (on the “Settings” tab) you can now select either to upload an instant copy of your site, for example before installing important updates. Previously this feature allowed saving to the server only. The backup results of your scheduled tasks on the dashboard have been updated to provide more details, including whether a recent backup of each of your sites has been created and alerts for any errors with remote uploads. The shield icon on your dashboard is now shown in green if a recent backup (created in the last 7 days) exists for your site and no malware alerts were found. As always we hope you enjoy the new features and stay tuned for the next update!